Connexus (Formerly Lacey Harmer) - Paw Taw John Services, Inc. 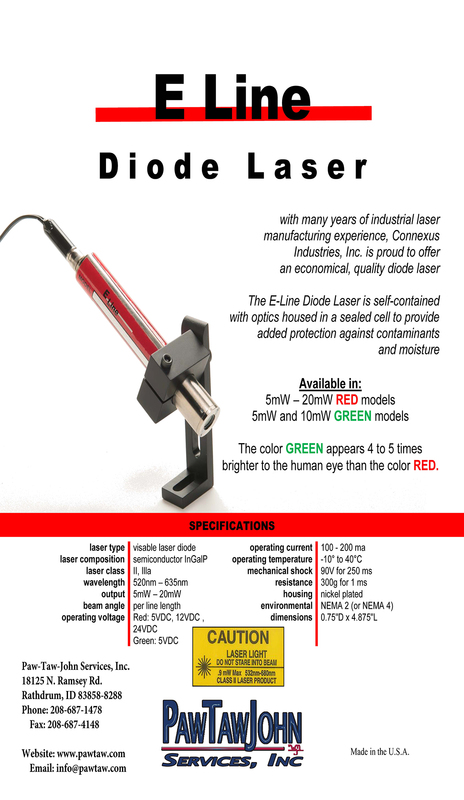 The E-Line Diode Laser from Connexus Industries combines versatility and affordability into one spectacular package. Available in both Red and Green models. Click on the link below for the data sheet. The GTD Series High Powered Green Laser from Connexus Industries is the Brightest Green Laser we sell. The GTD comes with Thermal Electric Cooling and Powerline Lens. This gives us stable output power and a consistent laser line. Click on the link below for the GTD Series data sheet. The LD-Series Diode Laser by Connexus Industries has been a benchmark in the industry for years. This diode laser is available in both cannon style and side shooter. Click on the link below for the LD-Series data sheet. "When we looked around to take on a laser line, we looked at numerous brands and chose Laharco® Lasers because of the quality of the product, years of experience and commitment to stand behind their product." - Steve Johnson, Vice President, Paw-Taw-John Services, Inc.
Click the worksheet link above and then fill in the required information. Return this form to Paw-Taw-John Services, Inc. This information will allow us to determine the fan angle of your lens, and thereby utilize all of the power available from your laser source. The new Laharco® self-contained assembly provides intense green light in three power configurations. Operating from 90VAC to 260VAC, these new diode pumped lasers maintain constant output power for ambient temperatures from 0°C to 40°C. The intense green beam is useful for visual applications in harsh or industrial environments, with optics housed in a sealed cell to provide added protection against contaminants and moisture. For the wood products, paper, textile, metal, food processing and other industries, accurate cutting is crucial to productivity. Miscuts add up quickly to account for a significant waste factor. 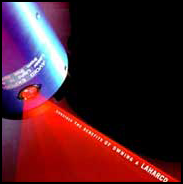 Laharco® laser technology, with its many unique options and models to fit specific industry needs, can maximize yields. The powerline lens, manufactured in-house by Lacey-Harmer Co., transforms the laser beam into a projected laser line even in width and intensity from end-to-end. This eliminates the problem of a projected line which is wider in the middle and fades toward the ends. Quality of the lens and professional alignment produces a line "string-straight", second to none in the industry. Custom optics are designed to meet specific customer applications. 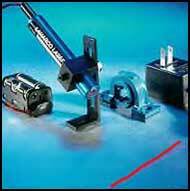 Laharco® Lasers are available in a wide range of models for your best mounting configuration. The User-Adjustable Intensity™ option allows mill personnel to install the laser and then fine tune the projected laser line for maximum operator visibility and more effective mounting. Laser heads are mounted with a special shock absorbing materials and are 100% tested to meet Laharco®'s exacting standards for power output. Power supply units are installed with special protection against dirty line current, a major cause of power supply failure. This means greater reliability and longer laser life. Superior construction throughout, from the rugged Schedule 40 Anodized aluminum housing to the soldered electrical connections and airtight seal on every laser. Every attention to detail means you get a laser with the industry's highest reliability, backed by Laharco®'s Full Warranty.